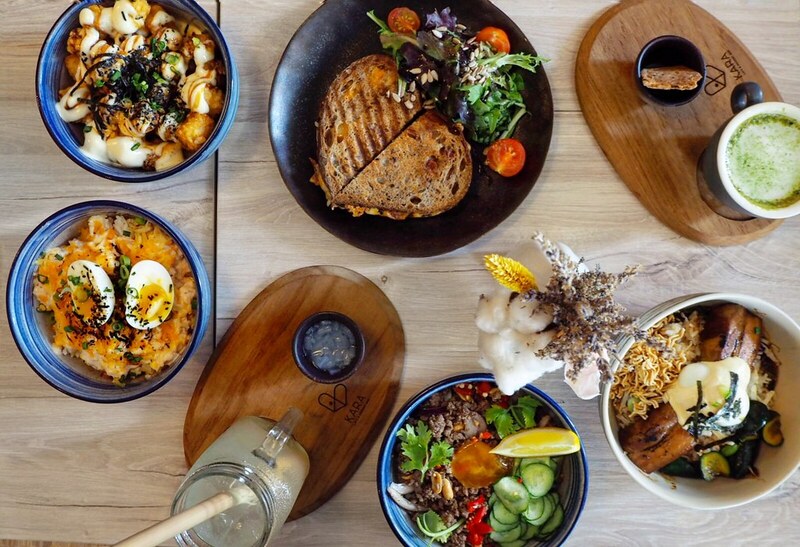 Opened by three very gutsy local chaps, No Milk Bistro offers a combination of good-old dishes and new-found flavours within its 2-storey unit at Padang Street. The Fish Soup Boutique at Level 1 is where a clear fish soup continues its 27 years worth of Teochew-style heritage, and The Rooftop Bistro at Level 2 is where a line up of tongue-tinging dishes awaits you. Upholding the traditional recipe of the Teochew-style fish soup is Chef Hoe Gern who believes that his full-bodied fish broth needs no milk to dress it up, and will have you coming back for it after you have had your third bowl. Mixed Fish Soup ($7) offers both sliced fish (mackerel) and fried fish (seabass), distinctive with a piece of Japanese Nori in place of seaweed. Compared to many highly acclaimed Teochew fish soups which I often find slightly too saltish, No Milk's take on the soup is much well balanced - you could easily finish it till the last drop and not needing a glass of water after that. The homemade sambal is the star too. Served only 2 days after making to allow its flavours to fully develop, it adds characters to a day-to-day dish. Some of the fried fish slices were drier but overall, it is a fish soup to be remembered when you think "what's for lunch?". Perhaps it is not just the fish soup alone that will have you consider coming back again. The array of side dishes with homemade sauces to complement your fish soup are great for sharing among friends and colleagues. 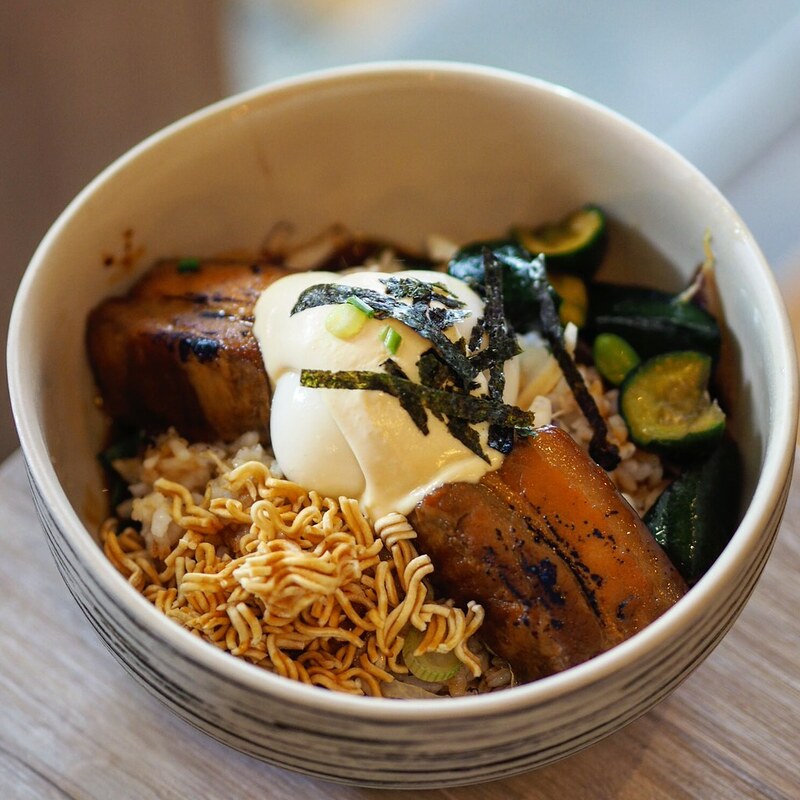 The most intriguing dish would be the Char Siew ($6.9). Not your usual sweet-glazed loin meat but a very tender slab of pork belly being caramelised to charcoal black, attaining hint of smokey sweetness. The homemade Ngor Hiang ($2) was not too tightly packed with meat but moist and juicy with vegetables bits. We liked the Grilled Pork Belly ($6.90) too, which was rustic with simple seasoning but could have been better if the salt level could be reduced by half. Among all the dishes we tried, including those served on Level 2, this Spicy Fragrant Egg Noodles (little spicy) stands out the most with its originality. The freshly handmade egg noodles was relatively lighter than regular noodles and was prefect with the rich homemade mala chilli sauce. I'm definitely not a mala person but that mala chilli sauce won me over with its pleasant sweet undertone, and the smell of the aromatic black vinegar effusing from the sauce got me hooked. Chunky with mushrooms bits, the noodles itself was moreish on its own. Served with fried fish belly (you can opt for pork belly), an effort from the chef of wasting no good ingredients, I would have appreciated the idea more should they taste less of a salt bomb. 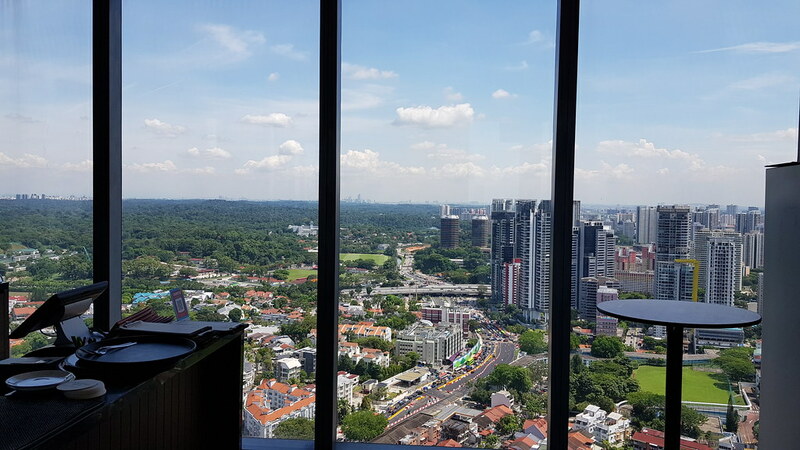 The Rooftop Bistro at Level 2 operates from 530pm to 12 midnight with fusion cuisines and drinks. Although No Milk does not brand itself as a pasta place, the handmade pastas here are definitely better than some of those who do. 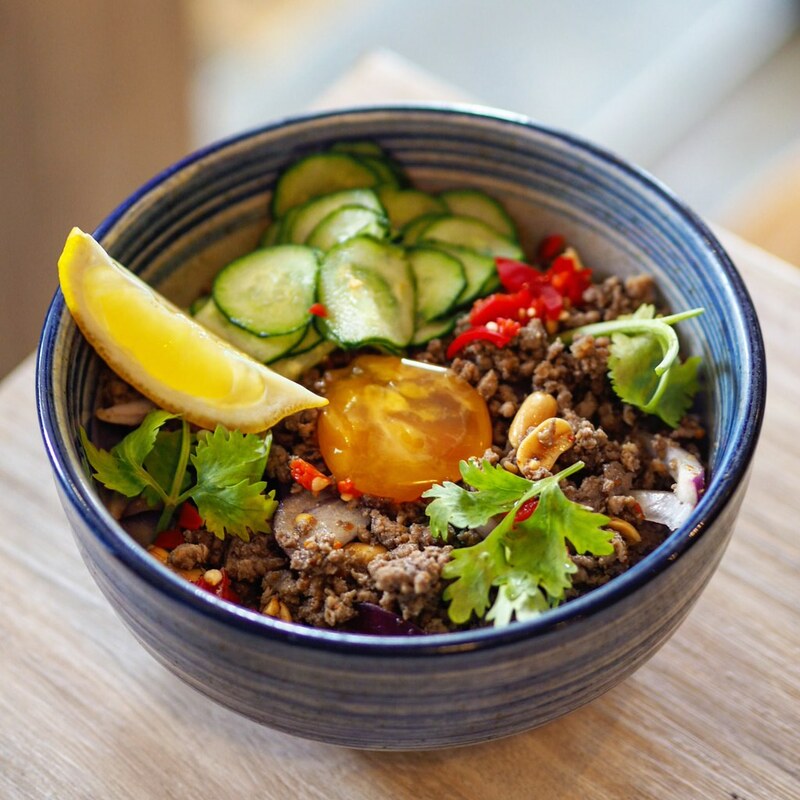 The Beef Rendang Tagliatelle ($16.80) features a tender beef stewed for 12 hours. The rendang was robust with its own juices and fats, and so easy on the palate. The tagliatelle was thicker than usual but exceptionally springy, and supported the beef rendang well. The Thai Red Curry with Tiger Prawns ($18.80) was piquant with a spicy kick. Forget about the regular quesadillas when you have this Tequila-marinated Angus Beef ($24). The D.I.Y part was fun, where filling up the tortilla with slabs of the beef, salsa and topping it up with a spoonful of the velvety mashed potatoes built up the anticipation. The buttery and creamy mashed potato is a star in its own right, available at $6 as a side as well. 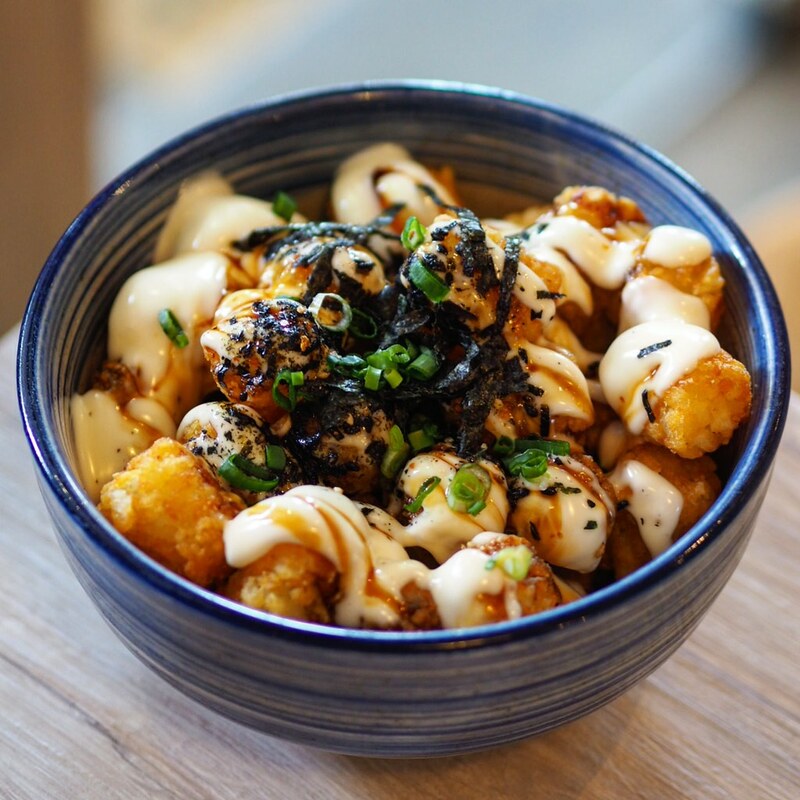 Every night is Ladies’ Night at No Milk, with discounts ranging from 1 for 1 liquor by the glass to 15% off bottles to Korean soju deals (3 bottles for only $42 with a free yakult mixer). I like how this concept of 鱼汤 is being executed and I find this Chinese moniker speaks much more than No Milk and has a potential to go even further. Somehow it reminds me of Lucy Liu in Melbourne. Perhaps, No Milk would find itself right at home as an underground bistro. 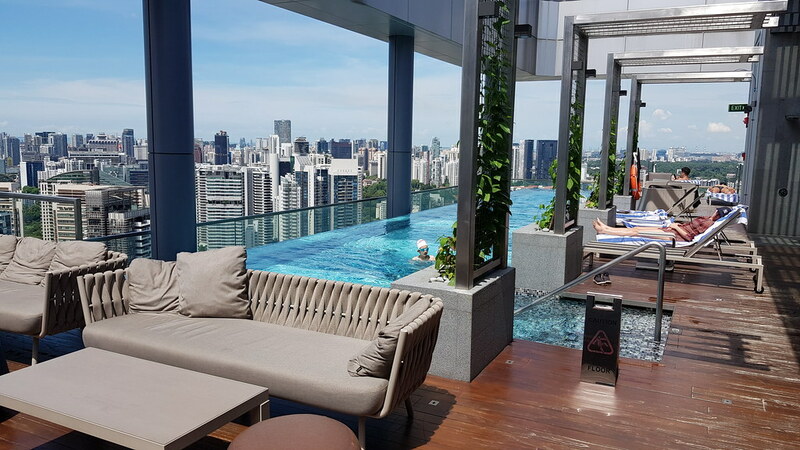 Nestled within level 33 of Courtyard by Marriott Singapore Novena is Urbana - one of the city's newest rooftop bar in an open-air setting framed by an infinity pool. 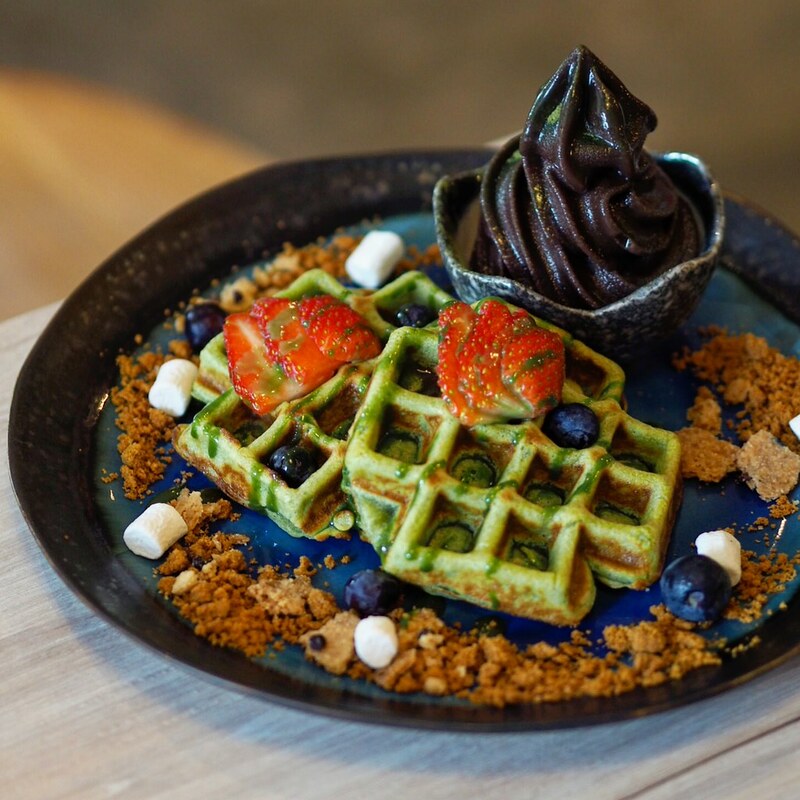 Launching its new Chillax Weekend Breakfast menu available every Saturday and Sunday from 11am to 4pm, diners can sit back, relax and enjoy lazy, lengthy breakfast fares at this highest rooftop bar in the Novena district which offers panoramic views of the cityscapes. All the breakfast specials on the new epicurean menu are prepared a la minute in the outlet's open kitchen. The first dish we had was the Duck Confit & Waffle ($18). 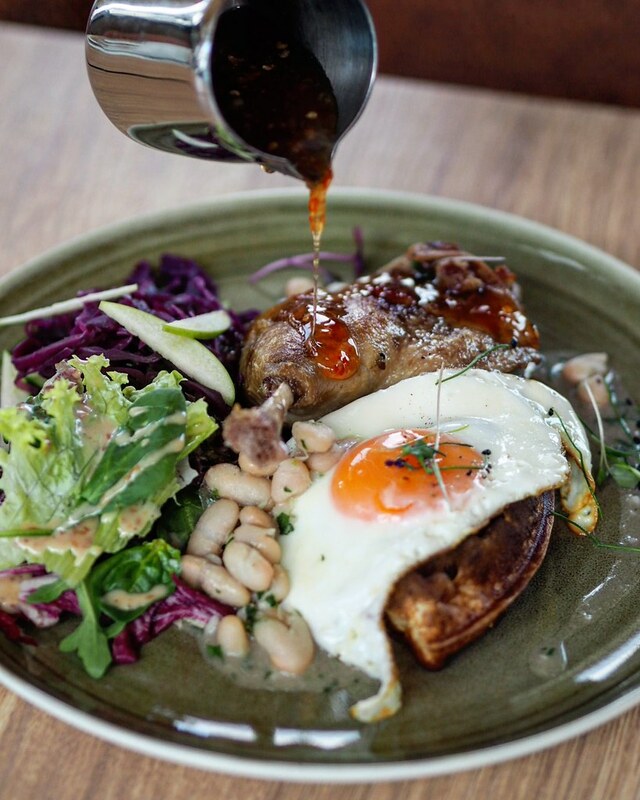 Crispy, fluffy waffles, tender duck confit beneath crispy skin, and sealed off with white bean cassoulet and apple slaw which adds a nice crunch to the dish. Reintepreted from the classic Southern dish with duck confit, this rendition sees a perfect marriage of French elements to a traditional American dish. 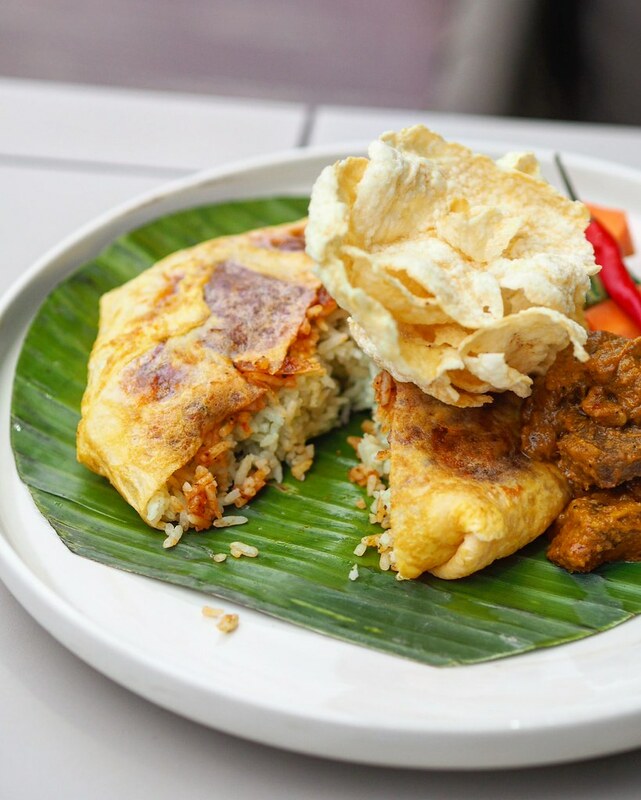 The Pandan Nasi Lemak Omelet ($16) comes in a generous portion of pandan flavoured nasi lemak rice wrapped in a huge thin omelet, coated with chilli just below the omelet skin to give the dish a sharp kick of spice. The tender beef brisket rendang has a nice spice aroma to it, which provides a richer flavour to the nasi lemak rice. Paired with pickled cucumber and belinjo crackers on the side to give a crunchy texture to the dish. 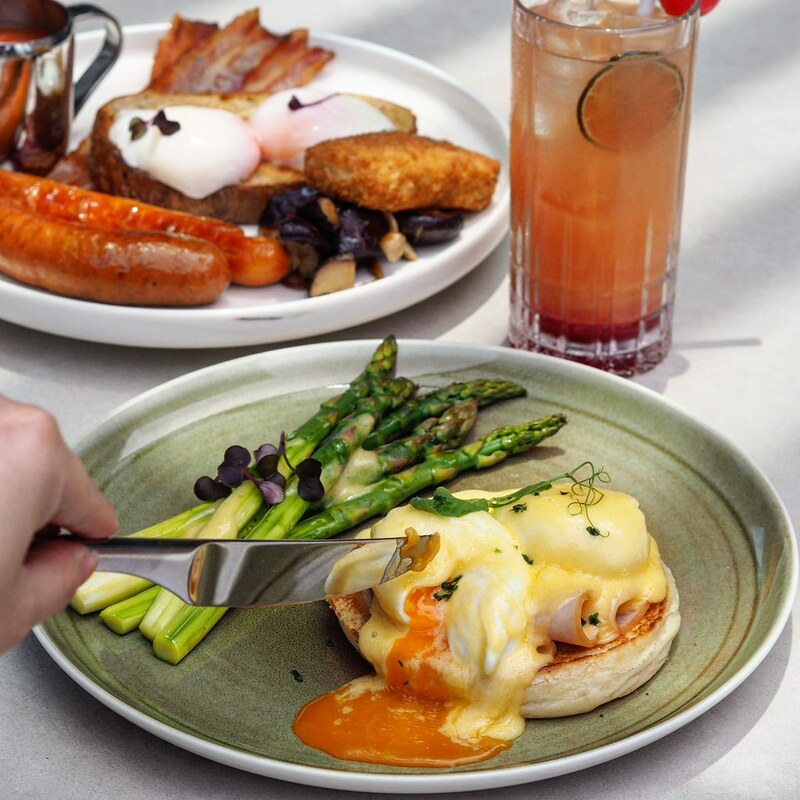 The Urbana's Late Breakfast ($22) and the Classic Egg Benedict ($18) are classic breakfast dishes which is no stranger to the breakfast aficionados. The breakfast platter comes in hearty portions of pork/chicken/beef sausage, streaky bacon, homemade hash browns, herb tomatoes , waffles, sous vide egg and hollandaise sauce which is sure to satisfy all your breakfast cravings. As for the Classic Egg Benedict, no reinvention is needed and all the elements are well-executed - with poached eggs served atop ham slices on English muffins, complemented with a generous drizzle of Hollandaise sauce. 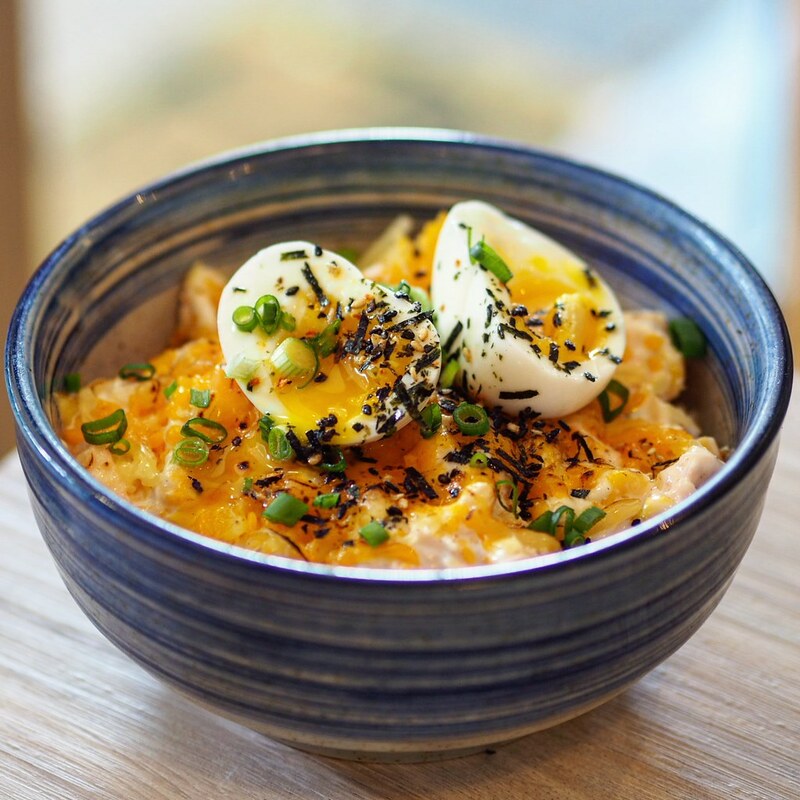 Slice the eggs to reveal the oozy golden yolk, which just binds all the elements together. 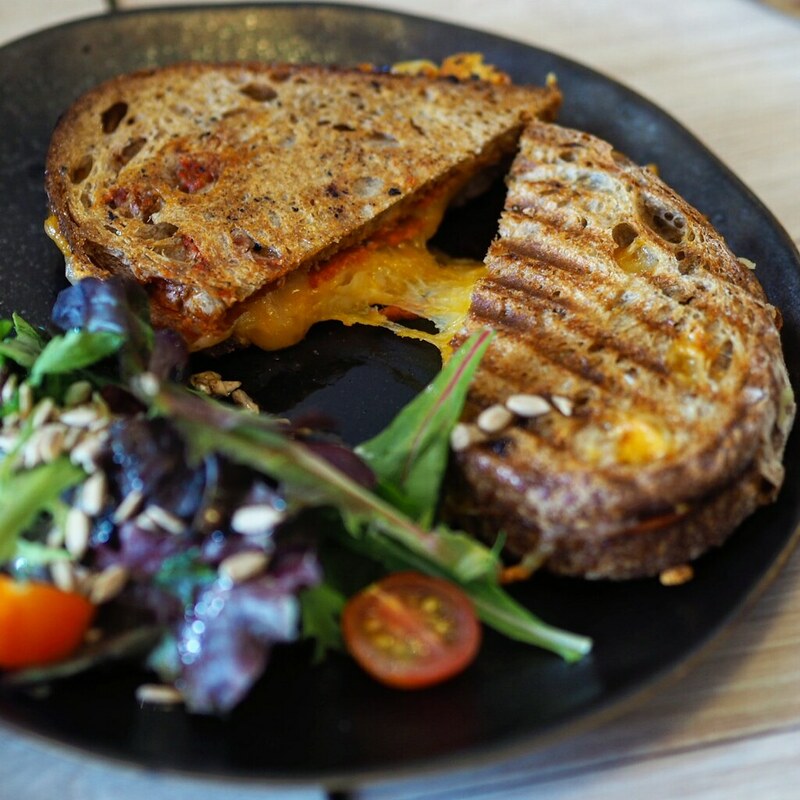 The Truffle Grilled Cheese ($18) hits all the right spots with tomato, avocado, cheddar, emmental and truffle brie sandwiched in between grilled sourdough bread. 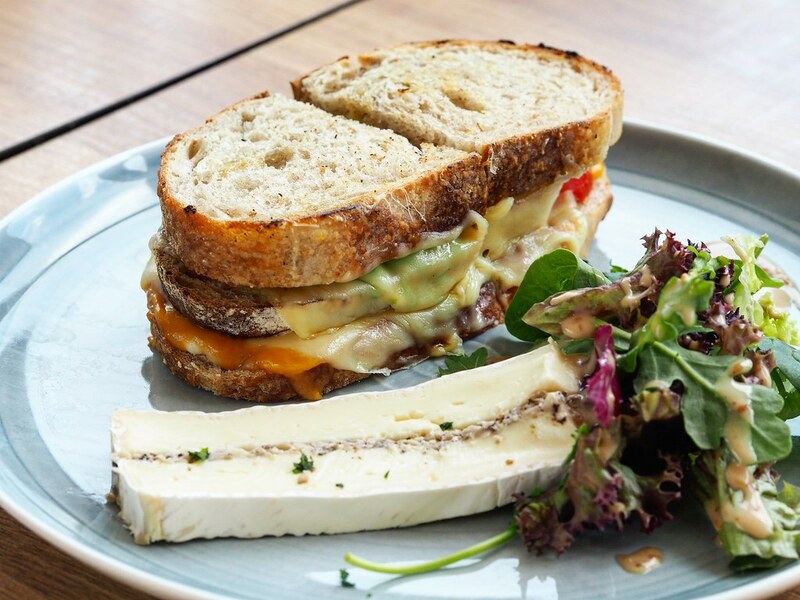 The melty gooey cheese flaunts a perfect combination with the crispy toasted sourdough, and with its flavours further enhanced by the strong truffle fragrance from the truffle brie. 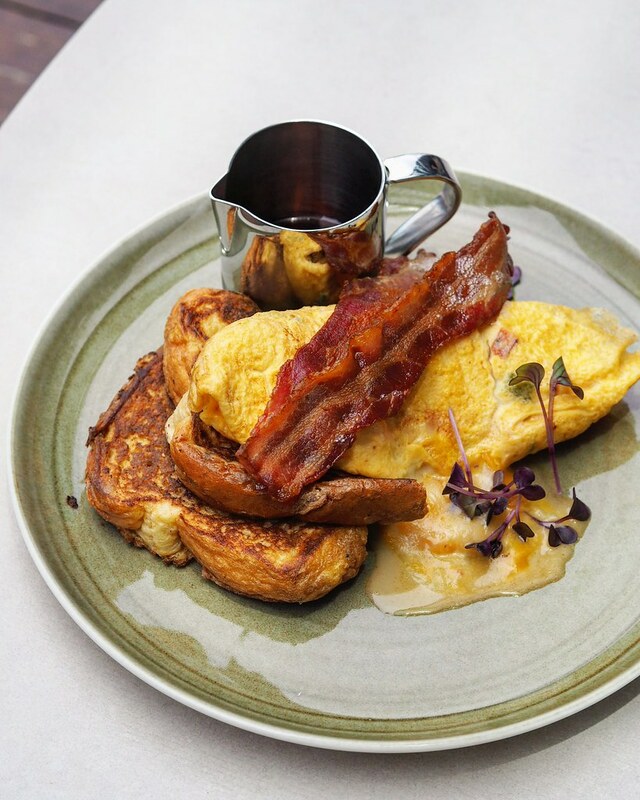 The dish comes with an Eggs of your choice (we opted for scrambled eggs), on soft fluffy slabs of French toasts and crispy streaky bacon. Drizzle the maple syrup all over which adds a nice sweetness to the savoury dish. 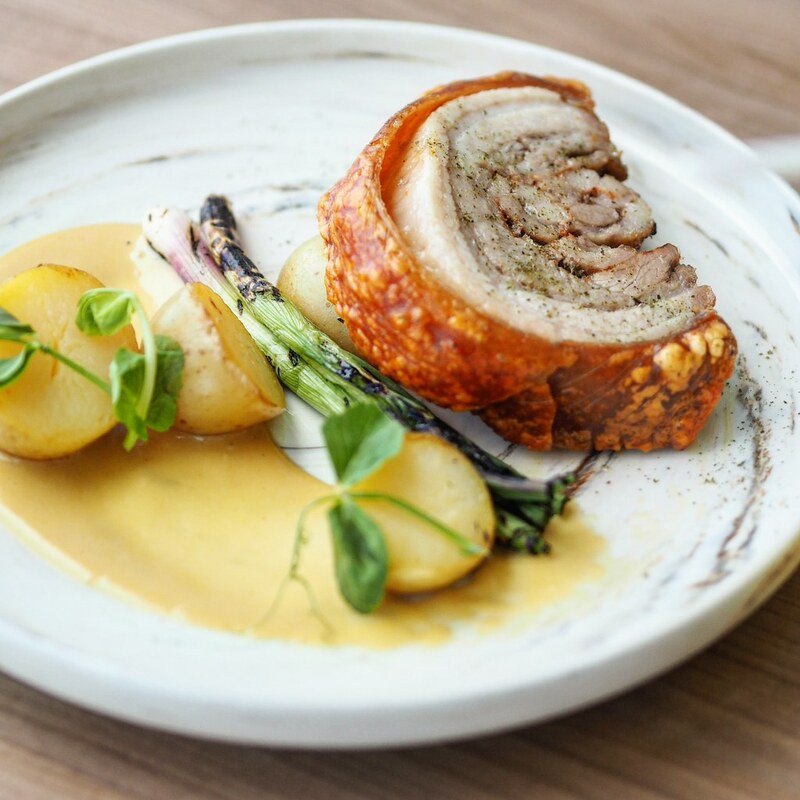 A special seasonal item which was off the regular menu and only available from time to time, the Pork Belly features juicy tender meat with an enjoyable crackling crisp exterior. Complementing the Chillax Weekend Breakfast are gourmet dessert choices of liquor laced desserts of sliced cakes, jar cakes and slab cakes such as the Bailey Tiramisu, Black Forest, Pina Colada, Jar Cakes, Kirsch Cherry Brownie, Urbana Cognac Cheese Tart, Brandy Toffee Nuts Tart, Orchard Pick Normandine Tart, and more, priced from $7++ to $8++. As a special treat, for any main course ordered, all coffees are at $1 only. 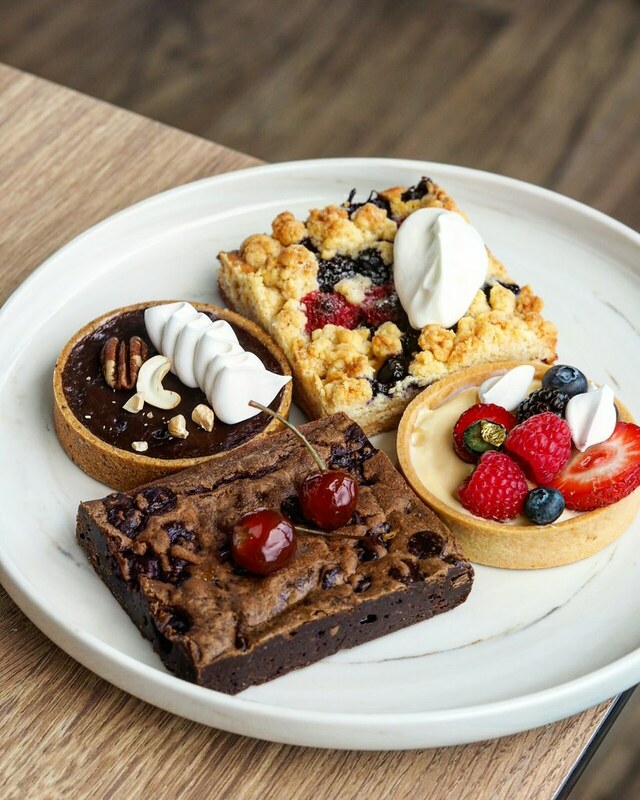 All the desserts are handmade from scratch by in-house chef. 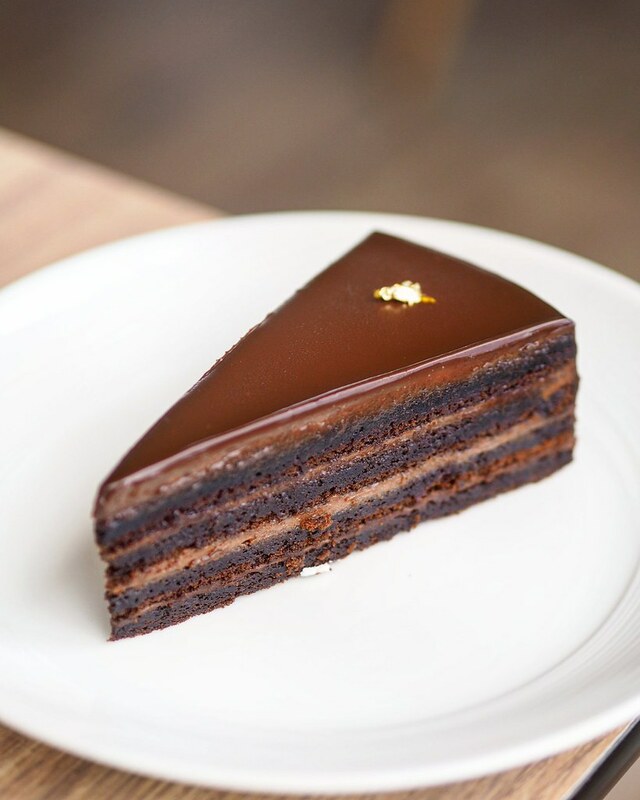 Some of my favourites are the Choc Fudge ($8++), and Bailey Tiramisu ($8++). 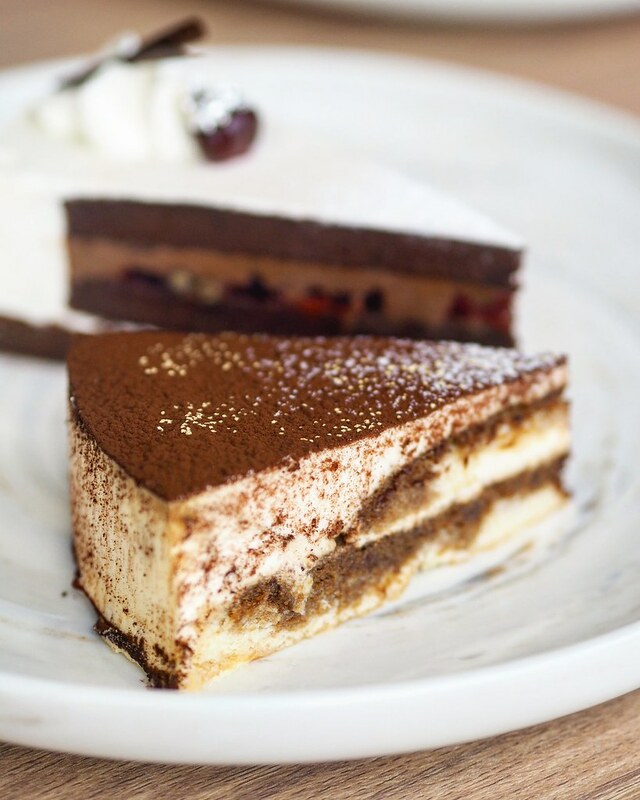 The soft layers of coffee-dipped savoiardi biscuits, creamy filling and chocolate just come together seamlessly, with a strong bailey flavour infused within the tiramisu. 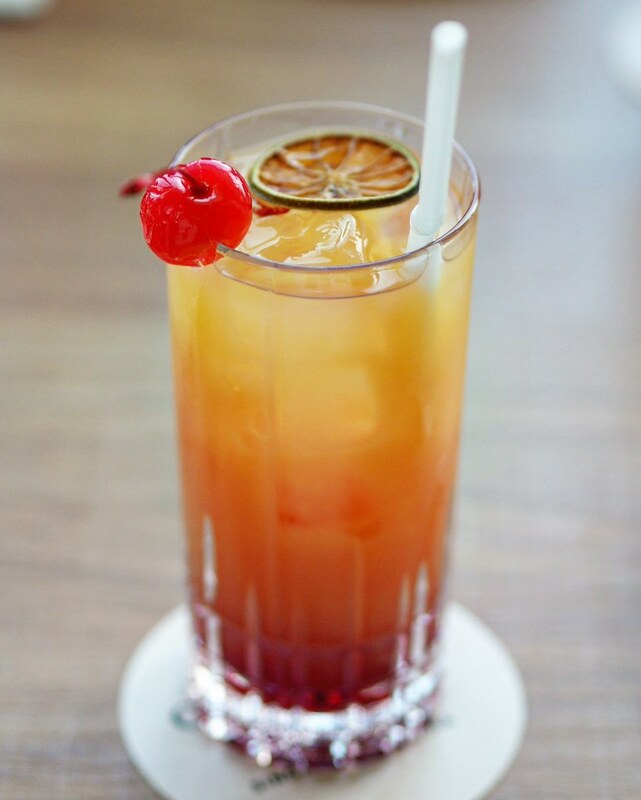 Sip on cocktails from the beverage menu as you enjoy a lazy brunch afternoon at Urbana, such as the Tequila Sunrise, made of tequila, orange juice, and grenadine syrup and served unmixed in a tall glass.